Win A YEAR’S WORTH of Shell fuel or Grab rides when you refer a friend! 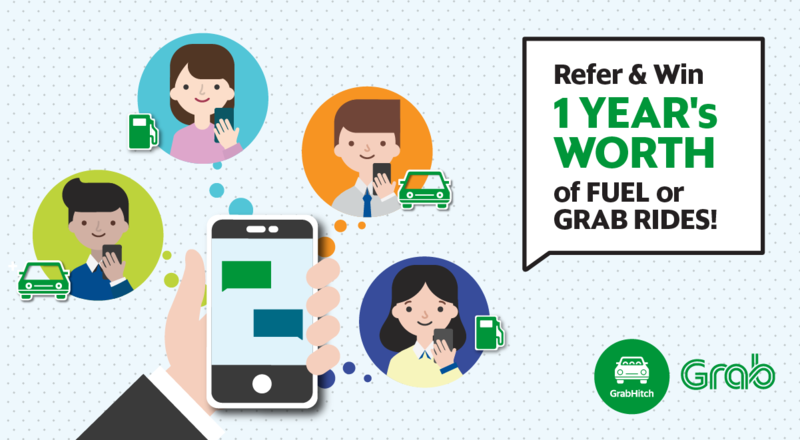 And that’s not all – when you refer a friend to drive with GrabHitch, both of you are guaranteed a reward of $20 each! Share the love with your friends now! A YEAR’S WORTH OF SHELL FUEL OR GRAB RIDES* TO BE WON! Refer a friend and both of you are guaranteed a reward of $20 each when your friend completes his/her first ride as a GrabHitch Driver by 31 August! *If you are an existing GrabHitch Driver, you will receive the prize in the form of Shell fuel vouchers. If you are an existing GrabHitch Rider, you will receive the prize in the form of Grab promo codes. If you are both a GrabHitch Driver and Rider, you will receive the prize in the form of Shell fuel vouchers. As a Referrer, you get $20 reward and 1 winning chance in both the Weekly and Grand Draw when your Referred Friend completes his/her first ride as a GrabHitch Driver within the respective Referral Periods stated below. As a Referred friend, you get $20 reward and 1 winning chance in both the Weekly and Grand Draw when you complete your first ride as a GrabHitch Driver within the respective Referral Periods stated below. 1. Your Referred Friend signs up using your Grab-registered mobile number (65xxxxxxxx) as his/her referral code. 2. Your Referred Friend completes his/her first ride as a GrabHitch Driver within the respective Referral Periods stated below. Not a GrabHitch Driver yet? *To participate in each Weekly Draw and Grand Draw, successful referrals (Referred Friend completes his/her first ride as a GrabHitch Driver) must be made within the respective Referral Periods. Weekly and Grand Draw winners will be announced here and notified via SMS on the respective announcement dates. 1. How do I participate in this contest? • If you are an existing GrabHitch Driver or Rider, get your friend to sign up as a GrabHitch Driver using your Grab-registered mobile number (65xxxxxxxx) as his/her referral code. • Make sure your friend completes his/her first ride as a GrabHitch Driver within the respective Referral Periods to earn you one winning chance in both the Weekly and Grand Draws. • Sign up using the Grab-registered mobile number (65xxxxxxxx) of your friend who referred you. • Complete your first ride as a GrabHitch Driver within the respective Referral Periods to earn one winning chance in both the Weekly and Grand Draws. 2. How are the winners determined for both Weekly and Grand Draws? All successful referrals made within the respective Referral Periods (by both Referrers and Referred Friends) will be eligible to win in both the Weekly and Grand Draws. Every successful referral earns one winning chance in both the Weekly and Grand Draws. A successful referral means that your Referred Friend signs up using your Grab-registered mobile number (65xxxxxxxx) as referral code and completes his/her first ride as a GrabHitch driver. E.g. If your Referred Friend signs up and completes his/her first ride in Referral Period 1 (1 – 7 August), both of you stand one winning chance in Weekly Draw 1 and Grand Draw. If your Referred Friend signs up in Referral Period 1 (1 – 7 August) but only completes his/her first ride in Referral Period 2 (8 – 15 August), both of you stand one winning chance in both the Weekly Draw 2 and Grand Draw. 3. How do I maximize my winning chances in both the Weekly and Grand Draws? • Make more referrals – the more successful referrals you make, the more chances you have at winning in both the Weekly and Grand Draws. • Make your referrals as early as possible – by making your referrals as early as possible, even if you don’t win in that Referral Period’s Weekly Draw, your winning chances will be carried over to the subsequent Weekly Draws. • Become a Referrer and start referring your friends to become a GrabHitch driver too! 4. How many times can I win in a Weekly Draw? Once. If you win in a Weekly Draw in this contest previously, you will NOT be entitled to win in the subsequent Weekly Draws. But you still stand a chance to win in the Grand Draw so keep referring! 5. If I do not win in a Weekly Draw, will my winning chance(s) be carried over to the subsequent draws? Yes! All your winning chance(s) will be carried over to the subsequent Weekly Draws. 6. Is there any limit to the number of successful referrals I can make? No! 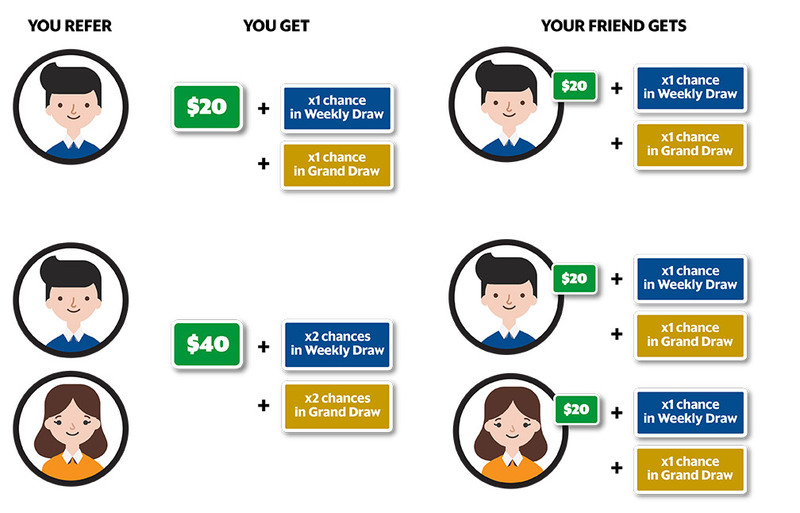 The higher the number of successful referrals made, the greater the amount of guaranteed reward ($20 per successful referral) and the higher your chances of winning in both the Weekly and Grand Draws. 7. How do I know if I have won a prize? 8. How and when will I receive my prize and reward? $20 reward will be credited to the Referrer’s GrabHitch driver wallet (if Referrer is a GrabHitch Driver) or GrabPay wallet (if Referrer is a GrabHitch rider) by the 10th working day after the contest has ended (i.e. post-31 August). • Grab promo codes will be credited automatically into your GrabRewards (you can view your promo codes in your ‘My Rewards’ page) by 1 October. • You are required to collect the vouchers at Grab’s Sin Ming office. Collection details will be provided. 9. Can I choose my prize? Unfortunately not. Any winner who is an existing GrabHitch Driver will receive the prize in the form of Shell fuel vouchers. If you are an existing GrabHitch Rider, you will receive the prize in the form of Grab promo codes. If you are both a GrabHitch Driver and Rider, you will receive the prize in the form of Shell fuel vouchers. 10. If I win Grab rides, are my promo codes transferrable? No, your Grab promo codes are non-transferrable.